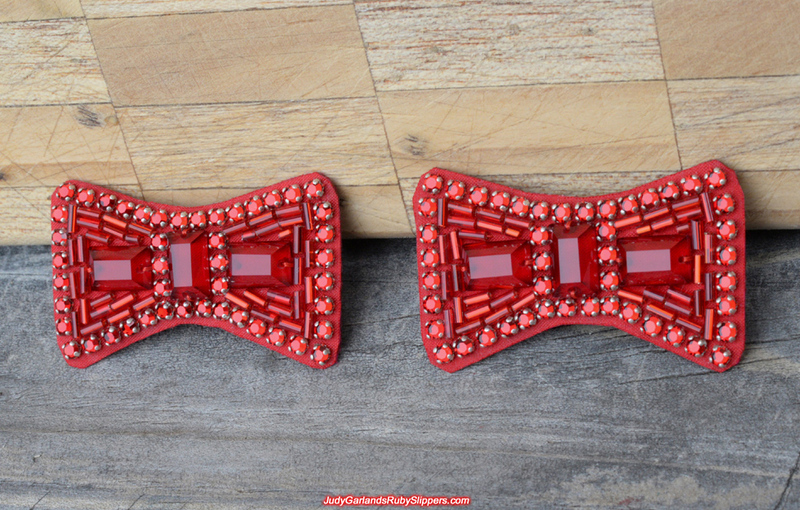 We created a beautiful pair of bows that we plan to use in the future. 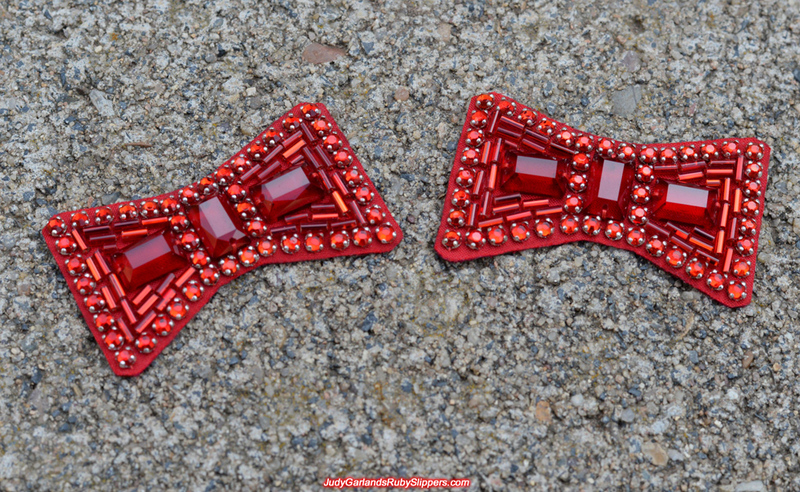 The shape on this pair of bows is a bit different to what we normally make in that the sides is slightly curved. 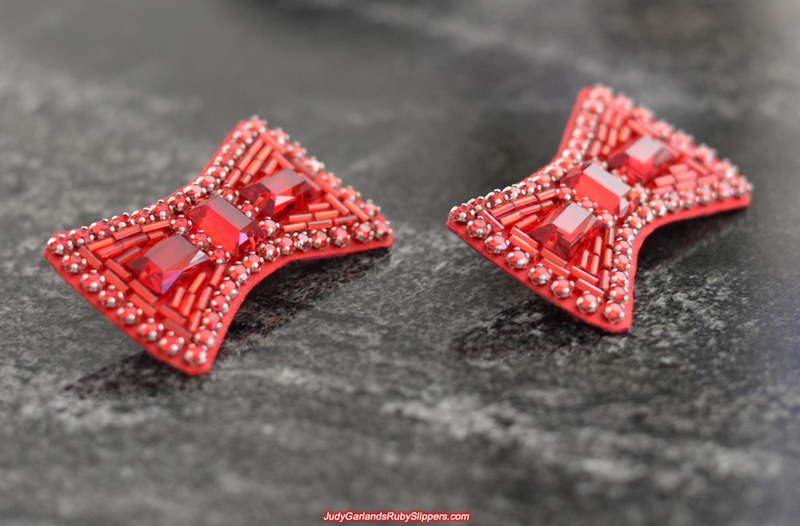 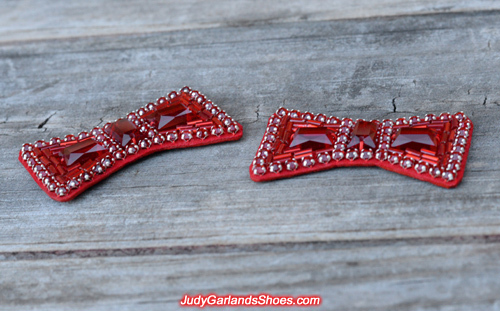 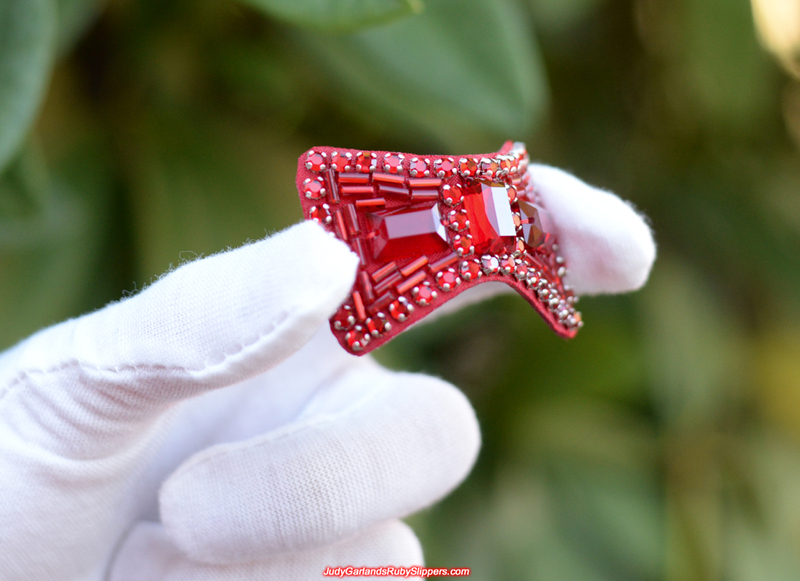 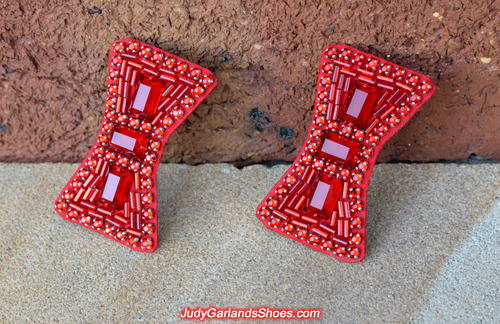 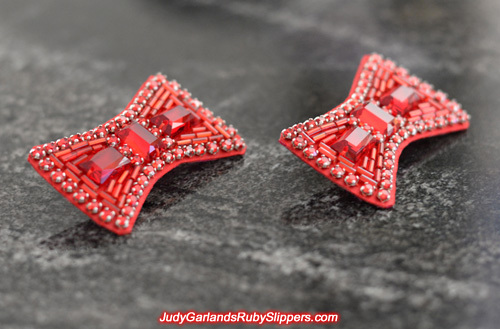 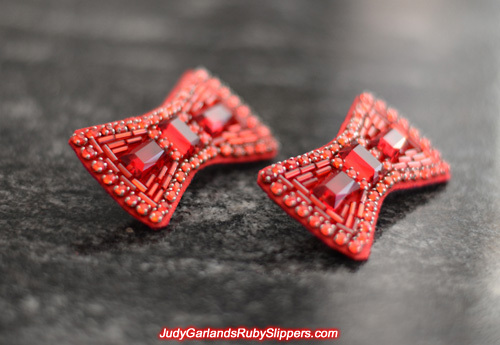 This shape was also used on the original ruby slippers so there's no right or wrong way of doing it. 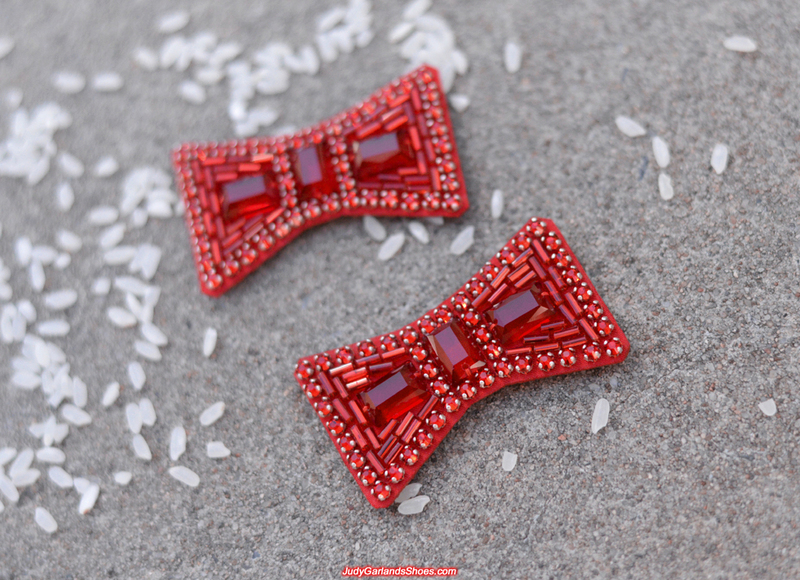 Like the original bows, all the stones and beads on the bows is hand-sewn and not glued, and we used red Lao silk fabric and leather. 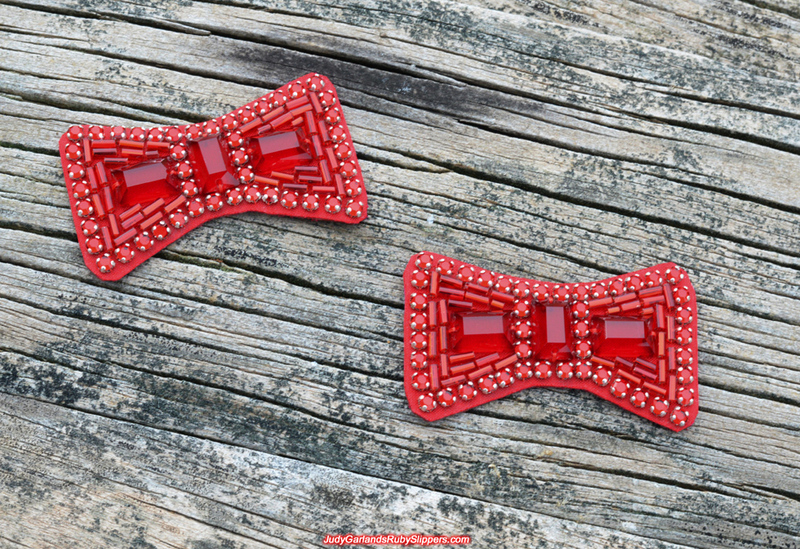 The bow-shaped leather is very thin and small as were the original bows. 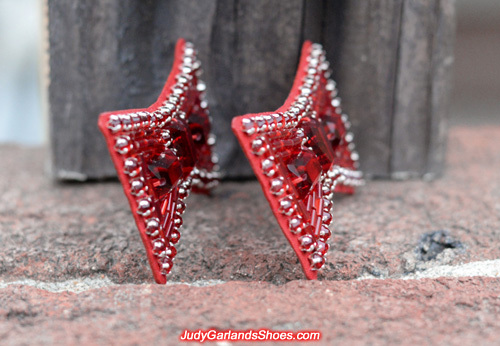 The rhinestones contain Swarovski crystals and match the originals in size, color and rounded claw settings. 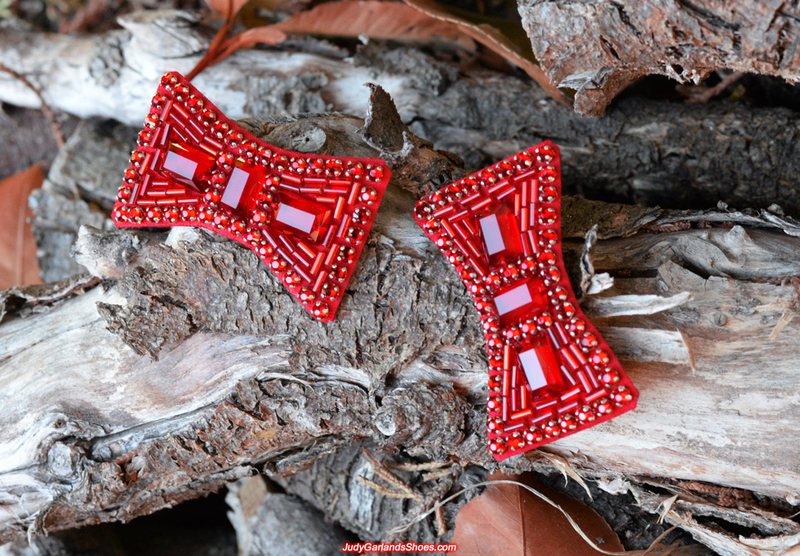 The bugle beads and high quality rectangular glass stones also match the originals, so this pair of bows is as authentic as they come. Every stones and beads on the bows have been sewn neatly and firmly. 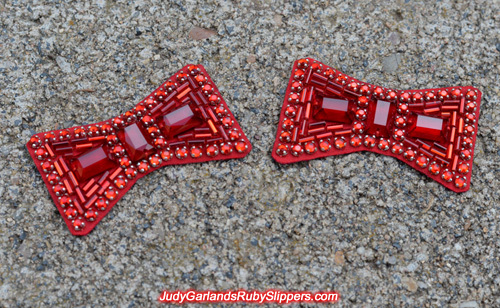 We are one of the best ruby slipper bow makers in the world and by looking at our work below, I don't think anyone can argue about that. 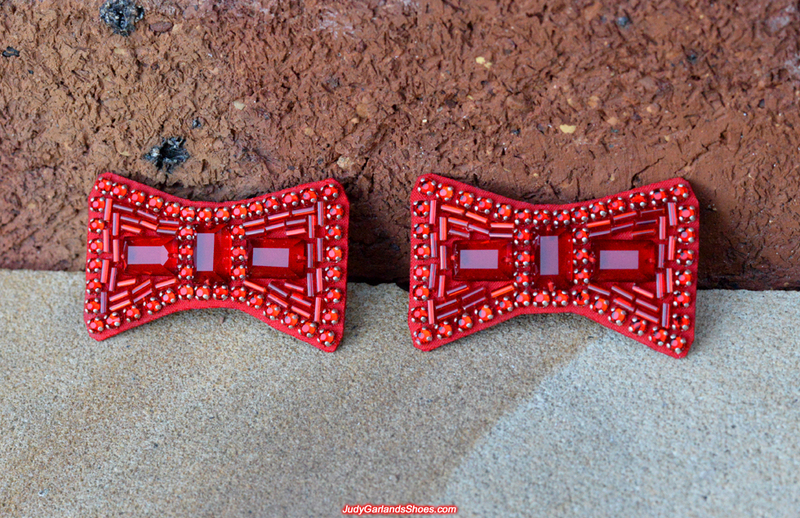 The first photo is a pair of bows that we made with straight sides. 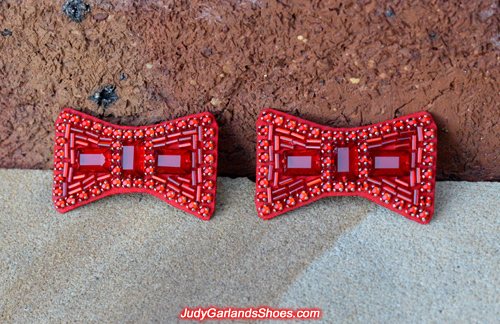 The second photo shows a comparison between the curve bows and straight bows. 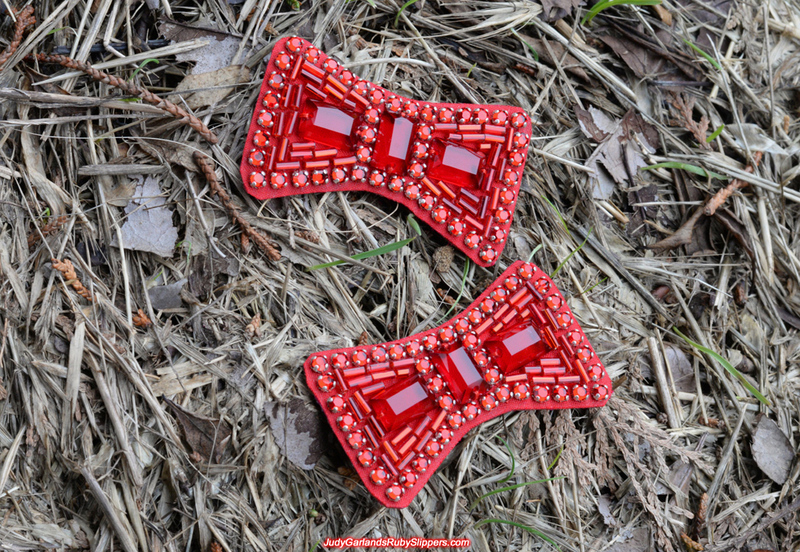 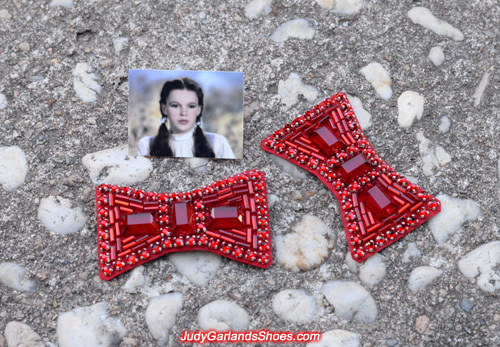 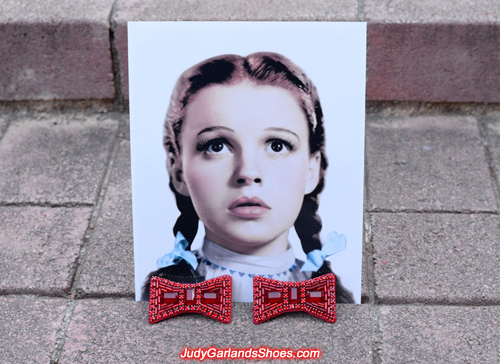 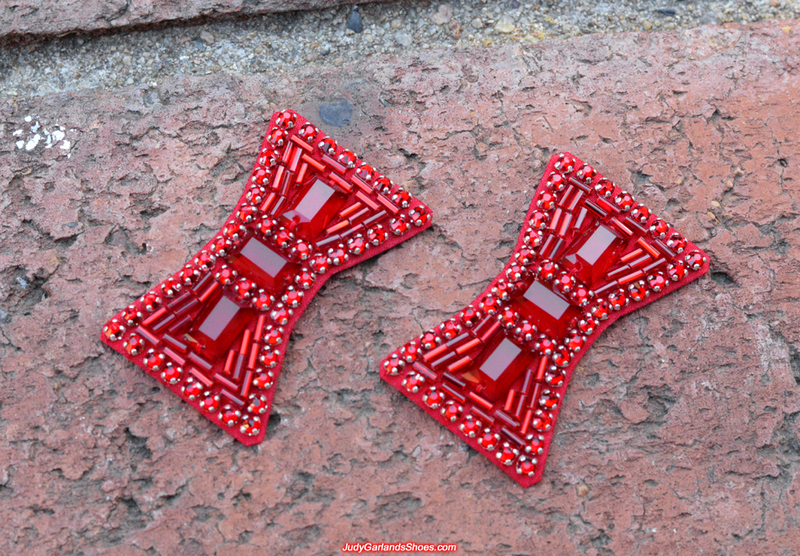 Perfection at its finest, the rhinestones, rectangular stones and bugles beads have been sewn very neat, straight, tight and firm like the original bows so that nothing becomes loose when Dorothy walks or jumps in the movie. 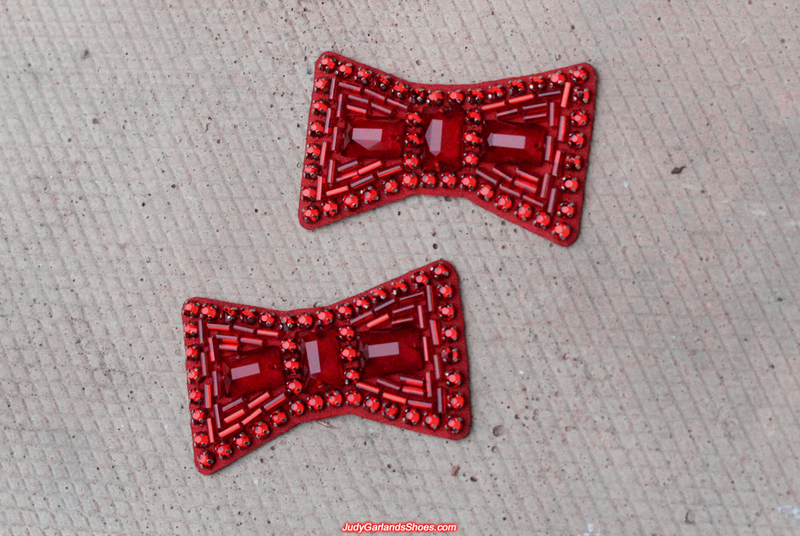 When crafting a pair of bows, we take great pride in attention to detail by always trying to make the two bow look identical. 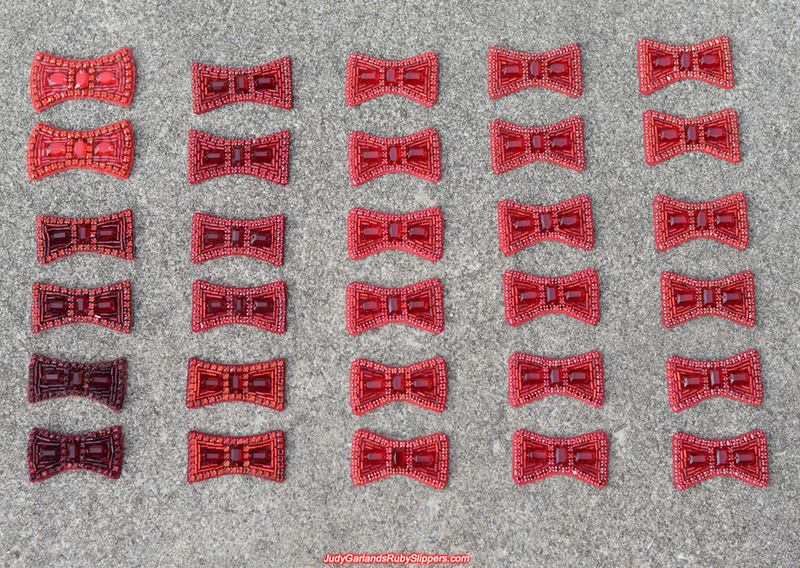 This means the placement and numbers of bugle beads on the first bow is exactly the same as the second bow. 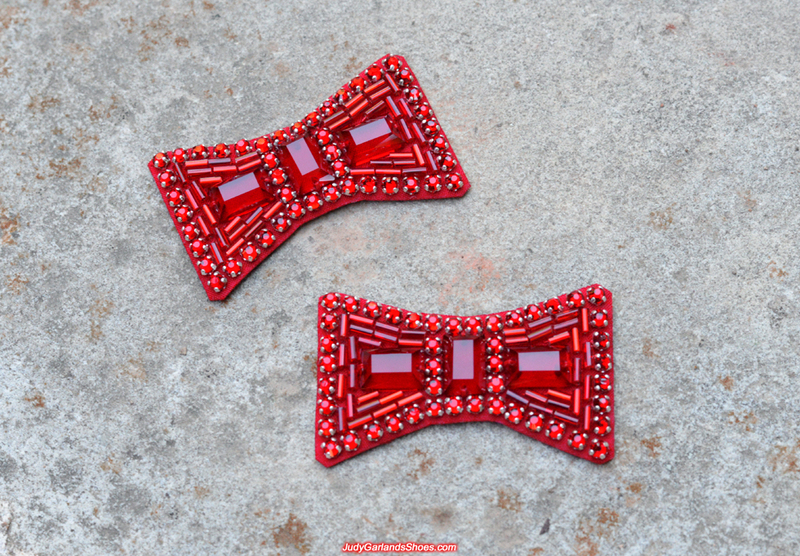 Making a pair of bows to be an exact copy of each other is not easy to do when hand-sewing with needle and thread, and requires a lot of skill to master. 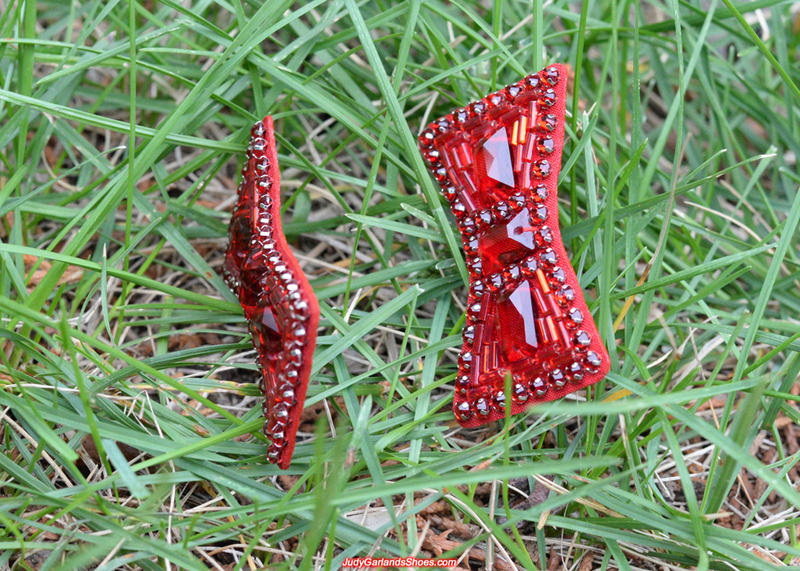 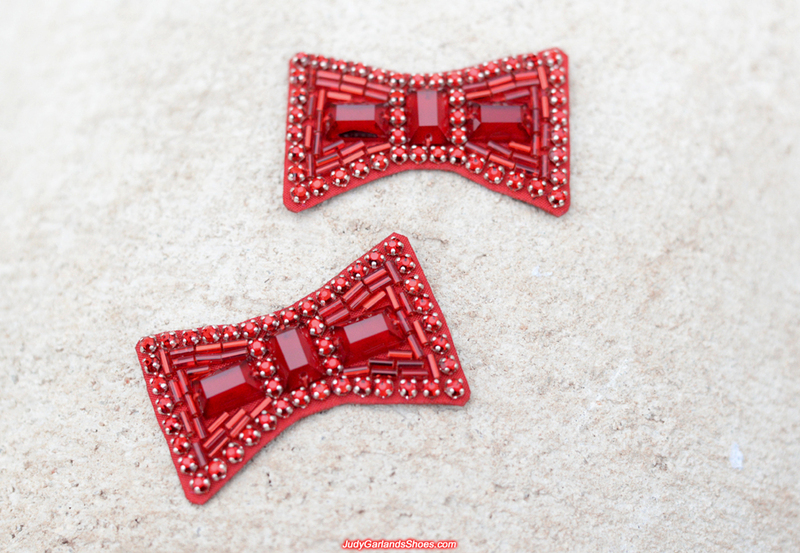 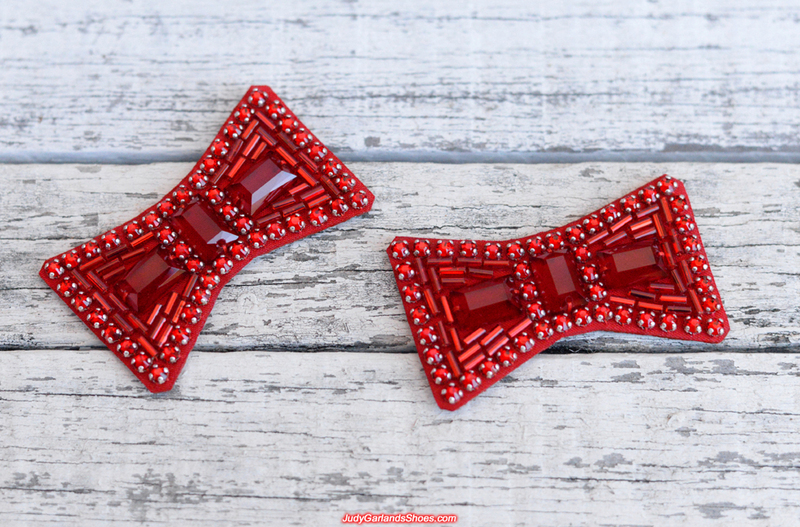 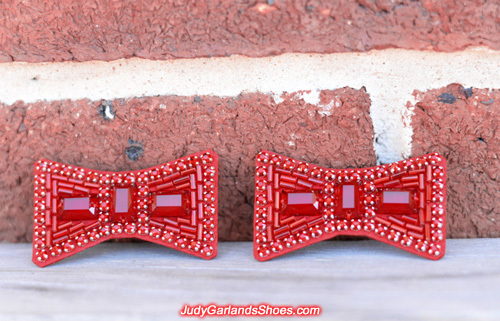 Both pairs of these high quality bows will be used on the ruby slippers, so by buying ruby slippers from us, you're not only getting a perfect pair of sequined shoes but also a perfect pair of bows with them. For information on how you can purchase a pair of hand-sewn ruby slippers, please email us, or simply send us a private message on our Facebook page. 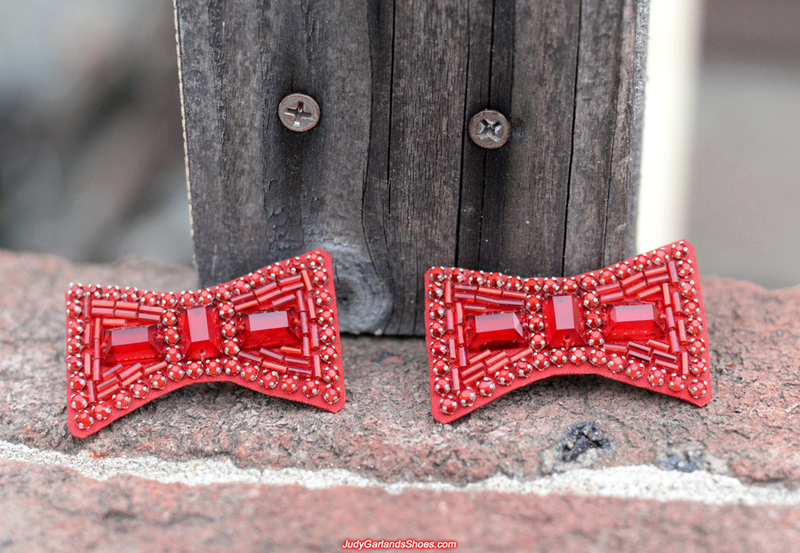 We like to make our bows thin, strong, light and flexible. 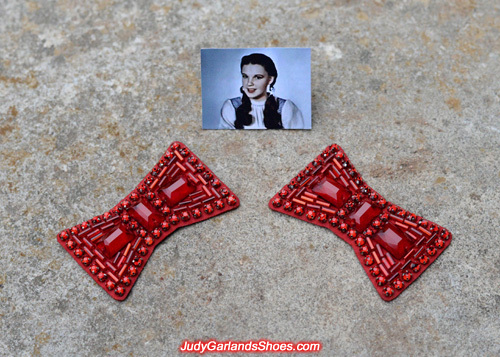 They are straight but they can also easily bend to appear wrapped over the ruby slippers if that's the style people prefer. 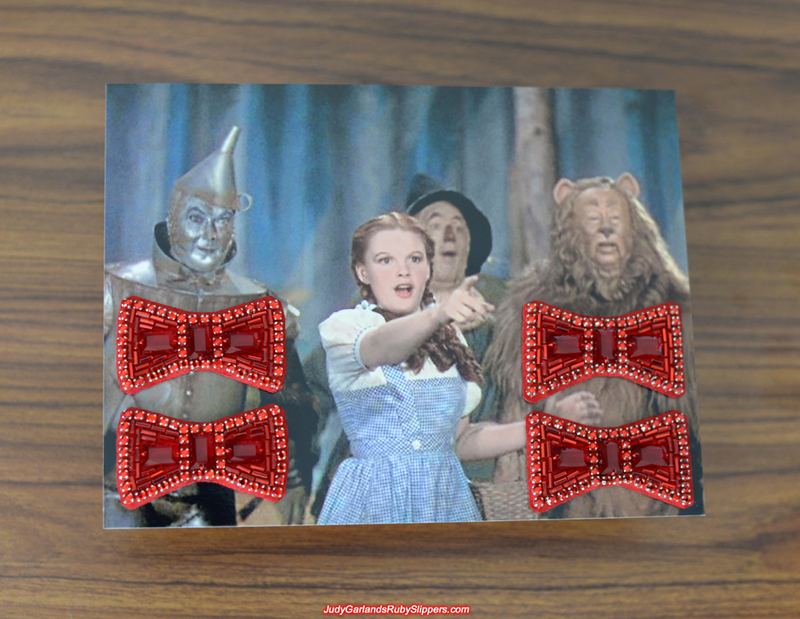 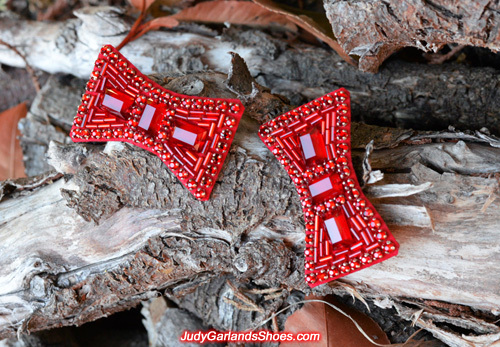 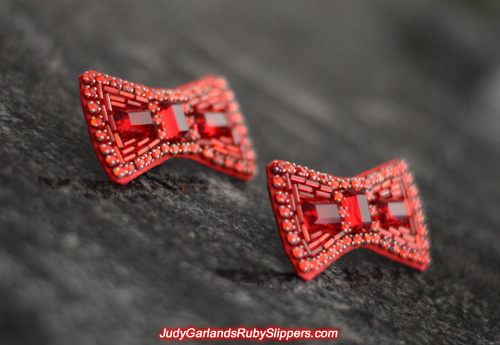 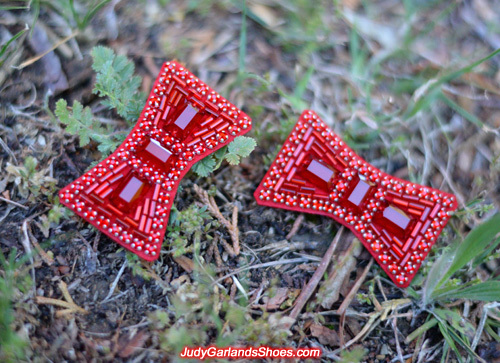 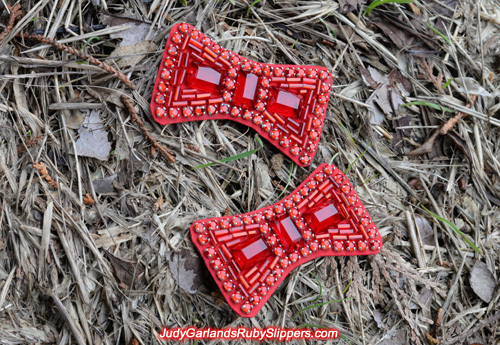 Bows of this quality doesn't need to be specifically used for ruby slippers. 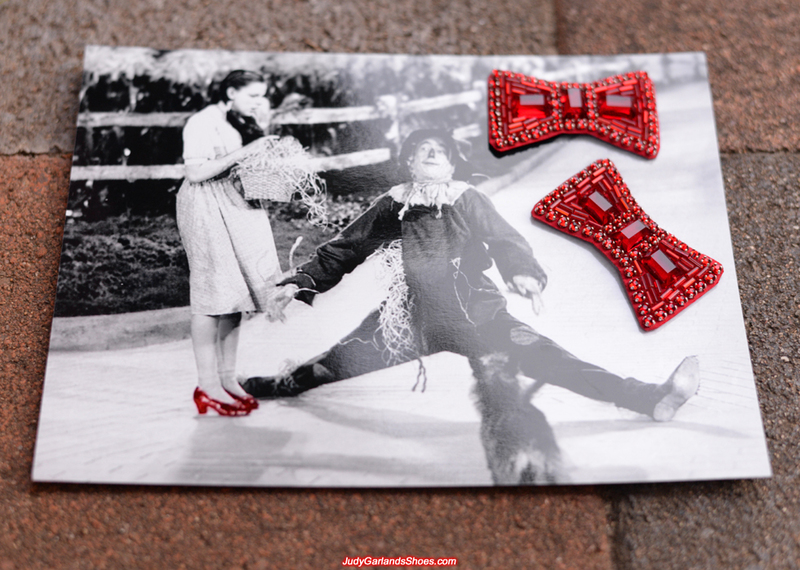 You can do other countless things with them, such as use them as a brooch to pin to your clothes, a fridge magnet, or a rear view mirror decoration for a good luck charm in your car! 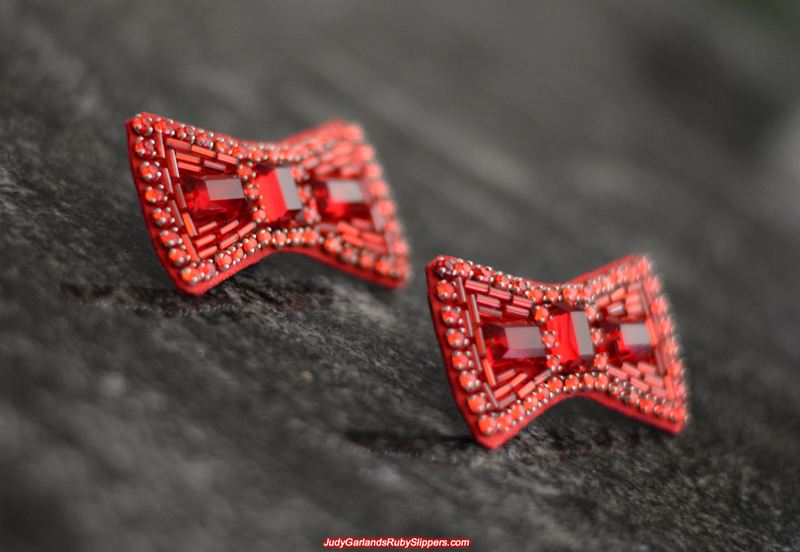 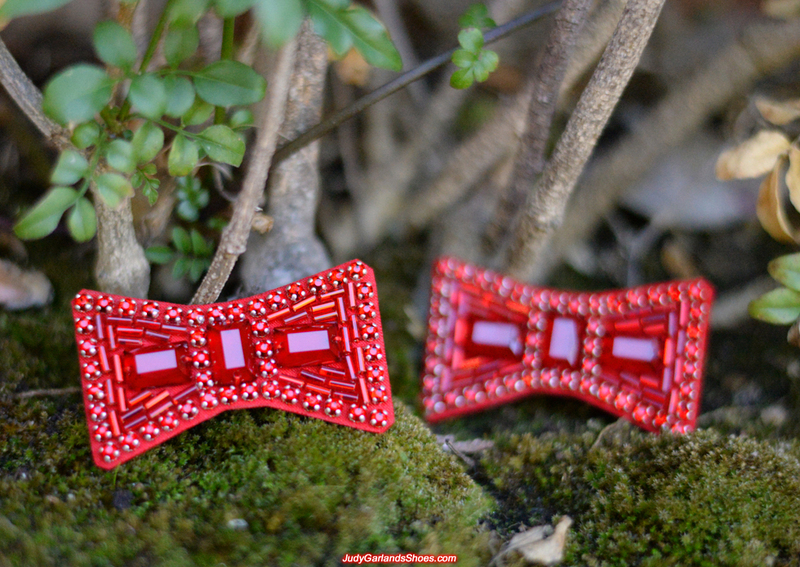 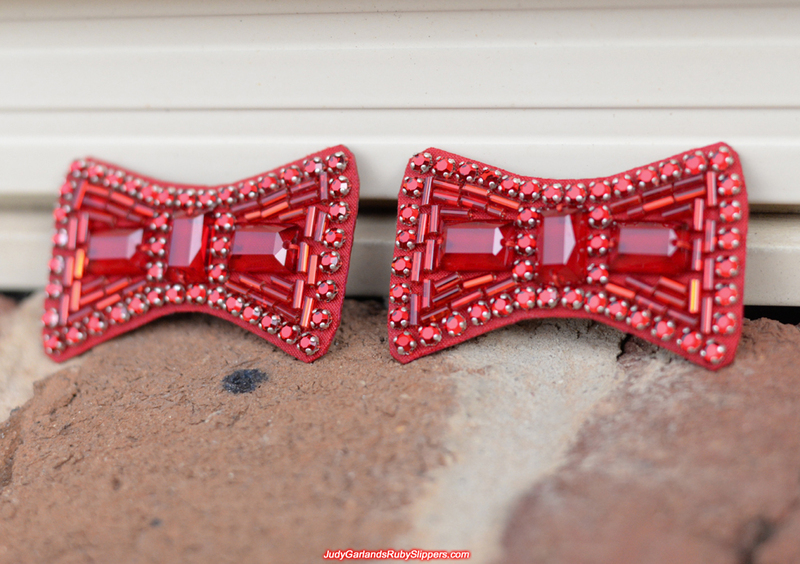 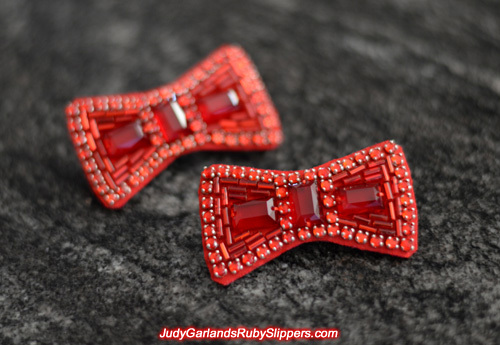 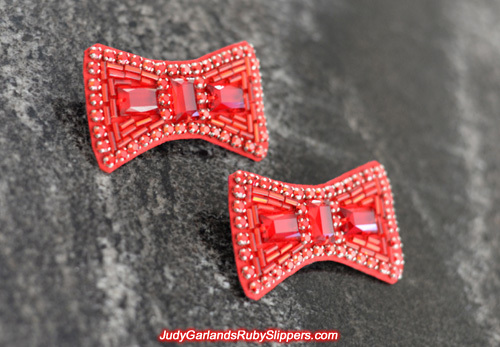 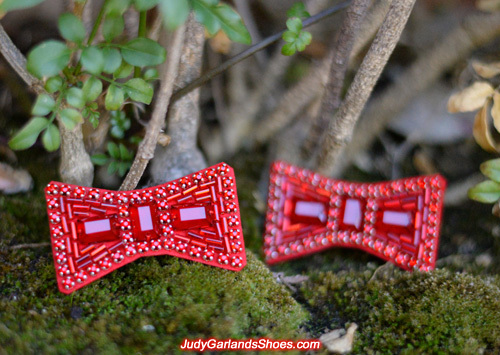 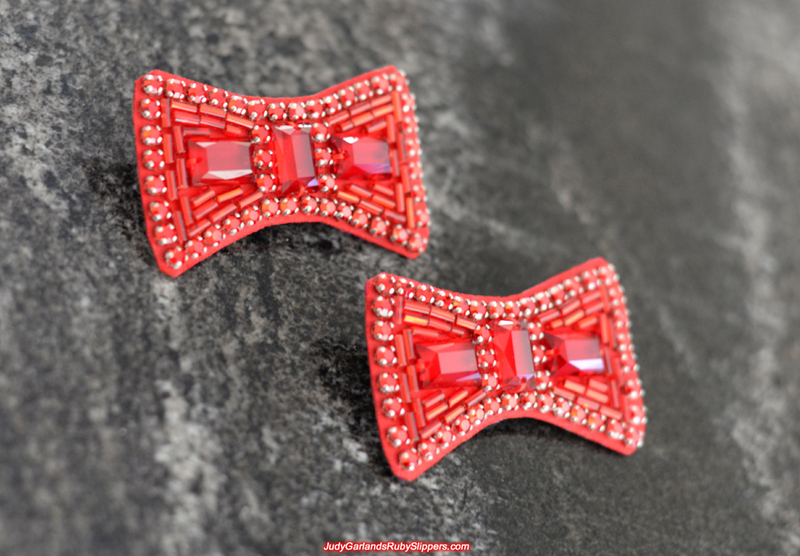 Exquisite hand-sewn ruby slipper bows crafted by not just one of the best today, but one of the best of all time. This stunning pair of hand-sewn bows is available for sale. 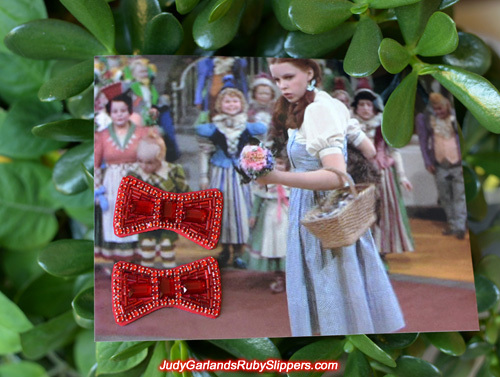 This is the kind of bows that we use on our ruby slippers and that's the main reason why our ruby slippers looks very beautiful and authentic. 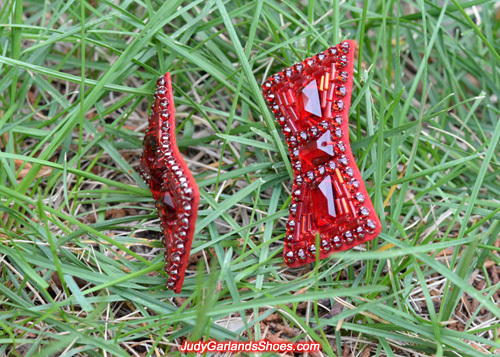 sewing but surely you cannot sew on a stone? Or can you? 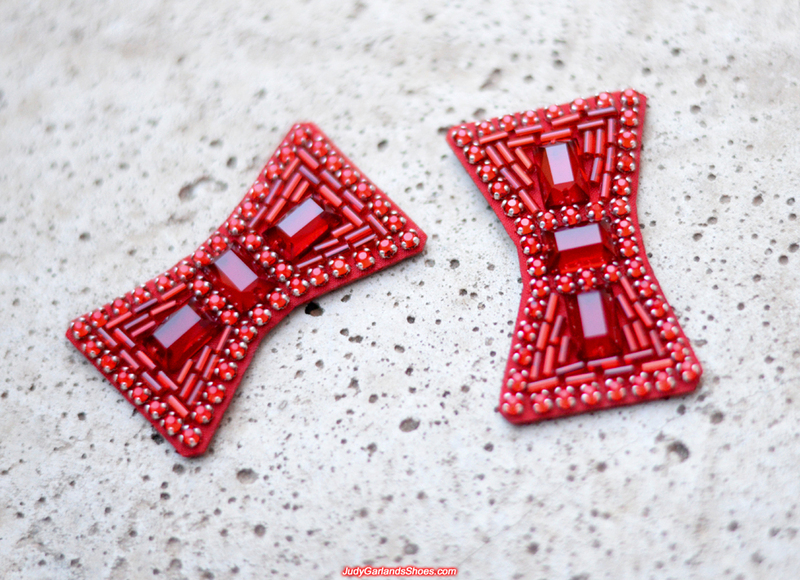 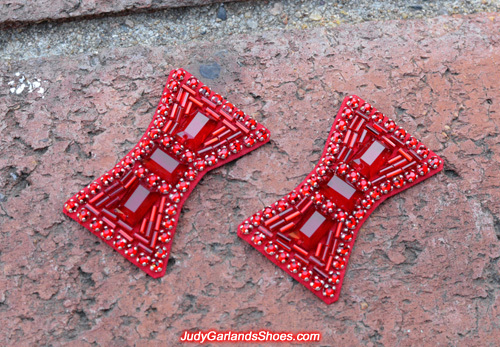 The rectangular glass stones, bugle beads and rhinestones all have holes in them for sewing by hand. Is the thread thicker and stronger for the bugle beads and stones than the thread used for the sequins? 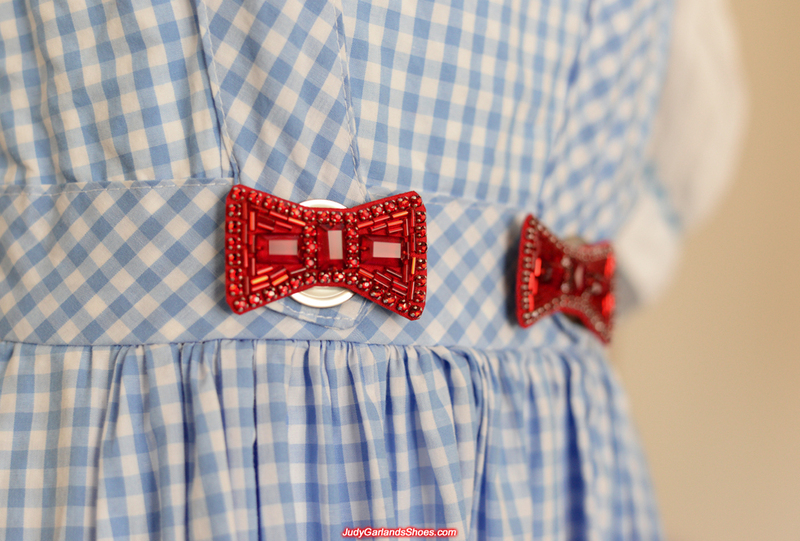 Am still flabbergasted that stones are sewn! 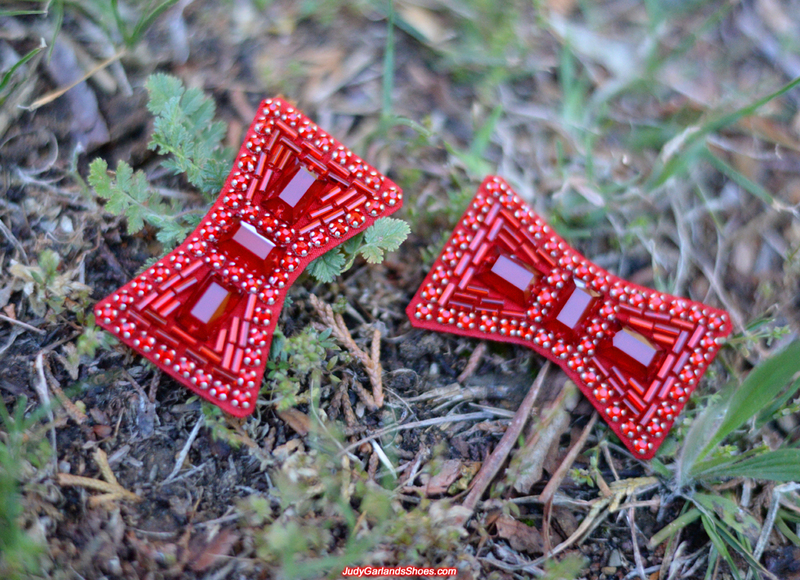 All the stones and beads on the original bows were sewn as well. 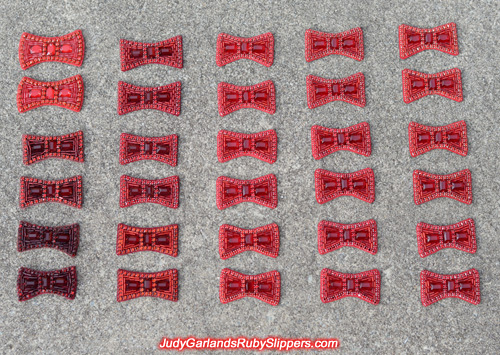 We use the same technique. A pair of bows with materials sewn is better quality than bows with materials glued. The materials are tiny, with tiny holes, so the only way to sew them is with a thin needle. 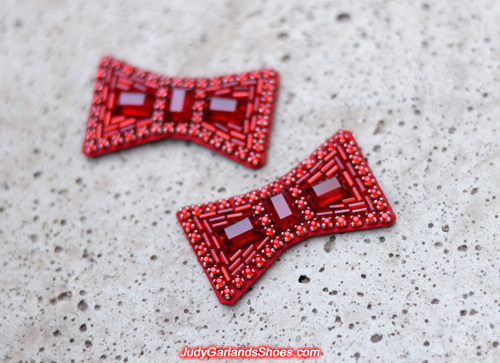 We use the same strong thread for the sequins, stones and bugle beads. The glass rectangular stones are sewn twice to keep them tight.